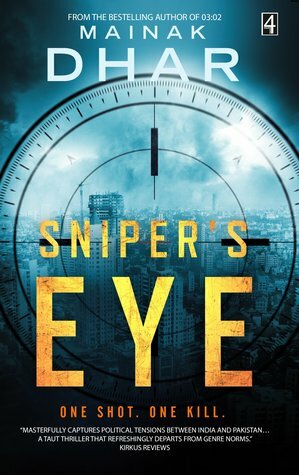 Sniper's Eye by Mainak Dhar is a suspense thriller. The plot based on a terrorist attack happen in Mumbai. It is the first book in the series of seven. The cover of a book goes admirably with the title. This is my first read of this author and I will look forward to more. The main characters of a story are Aditya Ghosh, working as a manager in Mumbai. He has no relatives or family member. Zoya, his co-worker, and love interest. They both were on a date and their life change upside down when a man killed in front of them. In order, to save other Aditya killed a terrorist and became a national sensation. He was a Para, a special task force in an army. Aditya lay low in Mumbai for three years. No one knows about his past, not even Zoya. But after this incident, the media expose his identity. Aditya didn't want all this. He runs from his past. But now he has to face the consequences of his doing. There is another character Ravi, Aditya's mentor and a father figure for him. He warned Aditya about the situation he got caught into. There is a sniper, Aman who wants to kill Aditya and avenge his brother's murder. In all this, Zoya got into trouble, and Aditya blames himself for her miserable condition. The story continues, and many secrets reveal. The description of action sequences is brief. But it has only Aditya's POV. Zoya's character is not described well. It reminds me of those Bollywood movies where all the focus and limelight give to an actor, and the actress was treated like a showpiece. She was there to listen to the actor's past and love him unconditionally. This story is all about Aditya Ghosh. The political tensions between the two countries are missing. The role of media and the facade they create is well described. This book gives an insight into corruption and how the government tries to cover up things for their own sake. But there are so many elements of a good suspense book are missing here. The part of Zoya's family came to an end which is very disappointing. I mean the author includes her parents when they have an objection on Aditya and Zoya's marriage, but not when their daughter is suffering from so much pain or when she was missing or attacked. I am a big fan of suspense and thriller, especially spy series or books. I know how the government or different agencies react when a kill list goes viral or an attack happen. I was expecting to read a story which gives me goosebumps and confused me about every next thing, where all my predictions go wrong. (It happened when I watched Quantico and Sherlock Holmes) But this story disappoints me. There is nothing new in this story. I can't connect with any characters on an emotional level. There's a lack of depth in every single person. But the language is simple and easily understandable. It's a quick read. Overall, I liked it. I recommend it to a newbie and those who want to read a light suspense thriller book. Till that shot... a high-caliber one, no apparent sound. And, the man in front of me fell. A rifle with a suppressor? A sniper in the middle of a Mumbai mall? As the body count mounted, I was soon sucked deeper into the chaos unleashed by that shot. To survive and save those whom I care about, I have to become the man I left behind. I have no choice but to tap into a bloody past that has put me on the terror kill list. I may also have no option to join hands with the sniper terrorizing Mumbai. The problem is that the man has sworn to kill me. In a world where the young and poor kill and die in conflicts started by the old and rich, I and my unlikely companion finally discover the thin line that separates a mere killer from a hero. Mainak Dhar is an alumnus of IIM, Ahmedabad, and has spent more than two decades in the corporate sector. A self-described cubicle dweller by day and writer by night, Mainak is also the author of over a dozen books, some of which have been bestsellers in India and abroad, including the bestselling Alice in Turkish, Vietnamese, Japanese, French, German, and Portuguese, reaching millions of readers worldwide.